In this edition, Congregational Leader Sr Clare Nolan celebrates some milestones for the Congregation and commemorates the lives of two of our much-loved Sisters, Marie Haren and Nola Riley. 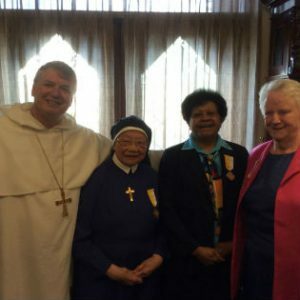 Stories include the Papal honours awarded to Srs Sesarina Bau, Jacinta Fong, and Anthea Groves; Sr Amanda Nguyen’s renewal of her vows; Sr Elizabeth Wall celebrating her Golden Jubilee. And there is the story of Sr Josephine Cannell, who celebrated her 100th birthday with a series of events in two States. A remarkable, loving and faith-filled woman, Sr Jo can show us all a thing or two about how to live.